The flexibility available from today’s video management solutions underlines why integrators and installers who are looking to deliver smart solutions are increasingly turning to software-based systems. VMS packages offer a plethora of benefits, over and above those available from the more basic hardware systems. As systems get more advanced, it is important to not lose sight of the fact that the first and most critical role of a VMS is to protect a business, organisation or public space. With this in mind, VMS packages that enhance protection are a necessity. Increasingly, security solutions offer more and more functionality. In the majority of cases, this must be recognised as a benefit. For integrators and installers, it enables the creation of bespoke solutions with high levels of flexibility and effectiveness. For end users, it enhances the return on investment from their security system, especially where the captured data can be used for business-related tasks. Today’s rapidly evolving technological landscape allows manufacturers to add advanced features and functions, and it is this innovation which drives the security industry forwards. However, consideration must be given to whether the depth of functionality available in modern solutions is always a positive point. While many VMS products do a good job of hiding their complexity behind intuitive interfaces, the sheer scale of options creates its own issues. Even system integrators and security installers who work with VMS software every day will inevitably find themselves reaching for the manual at some point. Most people will experience a mental block, albeit a temporary one, when looking for a specific setting or menu. As VMS software becomes more advanced, it simply isn’t possible to remember every single aspect of the system. Now consider the problem from the point of view of a system operator. Much like the integrator, they may use the software every day, but many of the tasks they perform are routine. Most operators don’t deal with incidents every day, and even if they do, the events they are managing will regularly change. While their everyday activities are routine, serious incidents are not. When faced with the need to deal with an unexpected situation, i is critical that they get things right. Familiarity with the system isn’t the only issue operators face. Some might not be fully familiarised with every site, especially if they are covering multiple locations. With the pressure of dealing with an incident, mistakes can (and often do) happen. With many VMS solutions being used across multiple sites, where camera counts are very high, the problem is exacerbated significantly. Even when operators are experienced with the VMS in question, have a good degree of awareness of the site layout, and remain fully alert at all times, the likelihood of something being missed during an incident is still high. A simple error such as switching the view to the wrong camera when following a suspect might result in something critical being missed. While footage can be examined after an event, often the most effective outcome is to deescalate an incident while it is in progress. Risk mitigation relies on resolving problems at the earliest possible opportunity. A well-trained operator can intervene while a situation is developing, and can often prevent further losses from taking place, or can ensure the safety of other persons in the immediate area. Any delay in this compromises on the overall quality of the security system. It must be said that this issue isn’t a fault with video surveillance technology or VMS solutions, nor is it a fault with operators. In order to enable the implementation of proactive action, it is important that the systems are as user-friendly as possible. It should always be remembered what we are expecting an operator to do: in high pressure situations, they need to make split-second decisions which are effective and intelligent, while also managing a complex system that could cover multiple sites. It is a significant challenge, and it stands to reason that using smart technology to assist operators can only be seen as a positive by end users. Given the recent advances in intelligent video analytics, coupled with enhanced processing power, it is fair to say that IVA can be used for more than detecting rule violations. Rather than simply flagging up events to the operator, who can then decide whether to take action or clear the alarm, the technology can be used to assist personnel while and incident is occurring. IPS Intelligent Video Analytics, a leading supplier of advanced video analytics technologies, has done just that by applying its 3D VMS technology to the IPS VideoManager VMS. The technology makes use of geospatial referencing to ensure that operators can easily manage video tracking and alarms during an incident. 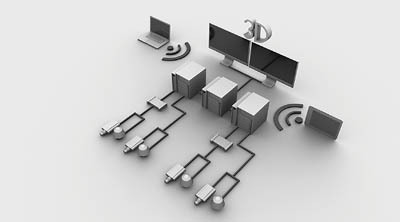 There are three ways in which the 3D VMS technology works. The first is to provide a simple one-click PTZ telemetry control option. By simply clicking at a specific point on a map, the nearest fully functioned camera will move to cover that area and a pop-up screen shows the video output. A graphical representation also appears on the map showing the camera location and its field of view. This allows any telemetry control to be carried out in relation to the specific area. The telemetry can be controlled either via the map overview or by using the mouse in the image stream. The second way in which the 3D VMS technology can be used is 3D Alarm Object Handover. When an alarm ‘object’ (which can be a person or a vehicle) is detected, the system will track it automatically. If the tracked object moves from one camera’s field of view to another, the georeferencing understands the locations of devices and subsequently switches the view to the next appropriate device. The tracking information is also shown in real-time on a site map. This approach reduces potential errors when switching between different cameras on larger systems, and allows an operator to view incidents without breaking continuity. The third way in which the 3D VMS technology can benefit the operator is arguably the one which offers the highest degree of smart benefits: 3D Alarm Object Tracking. This responds to IVA alerts, controlling a PTZ camera in response to an event from an overview camera. This allows the use of thermal imagers or static cameras to detect alerts. Once the PTZ camera has been triggered, it then automatically follows the alarm object, tracking it without any need for operator intervention. This allows security personnel to concentrate on what is happening without having to divert their attention to checking camera numbers, changing displays, verifying settings or other system management tasks. IPS VideoManager 3D VMS uses smart video analytics technology to supplement a flexible and powerful video management solution, ensuring that system operators can work more efficiently when dealing with incidents and events.